Hawkins\Brown is delighted to be working with Cardiff University to deliver Innovation Central. The building will be the world’s first social science research park, co-locating leading researchers, practitioners and policy makers. The core mission of the Social Science Research Park (SPARK) – to develop innovative solutions to societal problems through collaborative research – really informed our design. We have worked closely with University staff to develop new models for space use and the integration of industrial partnerships and collaboration in an HE context. The challenge for us was how best to bring together commercial tenants and university academics to create a stimulating setting for creative interactions and collaborations. We have done this by allowing the space and support necessary to both accelerate start-up growth and achieve a step change in promoting impactful inter-disciplinary research and translational innovation activity. Within the 12,000m sq building, there will be 2,800m sq of commercial units for spinouts and start-up businesses, including 500m sq of commercial wet lab space. The building will also integrate a secure data facility, a fabrication lab and a visualisation lab. The ground floor will be a public space used to celebrate and communicate the vision. A key part of this is a flexible auditorium made up of big steps and pull-out flexible seating cubes which could host TEDx style events. 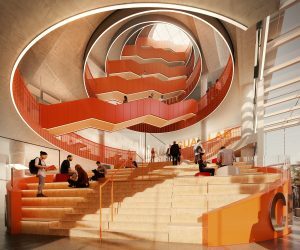 The ‘Oculus’ is the big idea at the heart of the building, connecting the seven storeys. It is a sculptural, open staircase travelling through a slanting void. The aim of the Oculus is to drive engagements and collaborations between the varying users of the building. It starts as a ‘social stair’ and forms breakout zones to each differently curated level. Activities within the building require very different environments – from quiet spaces for the secure data facility to the buzzing public ground floor. The building needs to respond to this, whilst creating a flexible, re-programmable floor plate. We have designed the building by activity instead of department, using ‘activity based working’, with the more private, secure spaces further away from the Oculus and the open plan / breakout zones hugging it. Researchers want to engage, collaborate and promote; the façade enables the activity within the building to be seen from outside, particularly around the Oculus. The ground floor space maximises the amount of glazing, to blur the line between the inside and out. A restaurant and event space makes it a great place for staff and the public to meet, learn and network.. Innovation Central will be a hub of world-class research, creativity, knowledge, discussion, and debate where innovation can truly flourish.